Just prior to selecting one of the following visualization tools, guide your child into a relaxed space. Find a comfortable position with few distractions. Take a few deep breaths together and explain that the purpose of your meeting is to use your imagination to “say goodbye to worries”. For especially anxious children, you will need to have a meeting daily for a while so that their minds can rehearse and repeat this practice, establishing new mental patterns that promote calm and ease. Guide your child in a body scan. Tell him you are going to go and find the worries and collect them so that you can send them away and feel better. Invite him to close their eyes and look inside their bodies for any place that a worry might be. See if he can find where the worry is. Ask him to describe what it looks like, (color, shape, texture, temperature, etc…). Next tell him that you are going to do some activities to send away the worries and select from one of the following tools. Trap Door. Put the worry into a package and place it in front of a trap door. On the count of three, open the trap door and watch the package jet away down the longest shoot ever and disappear. Bubble. Put the worry into a bubble and send it off into space. When it has floated very far away, pop the bubble! Watch the worry vanish. Feather. Transform the worry into a feather. Place the feather on your hand and blow. Not gone yet? Blow again and again and again until that feather floats away. Worry Soap. Place the worry on your hand. Get a giant bottle of neon, sparkly worry soap and squirt the soap all over your hand, making foamy expanding bubbles. Scrub scrub scrub those bubbles. Add a blast spray of water, washing the worry away down the drain. Rock. Transform the worry into a rock. Get a helicopter to drop the worry into an active volcano that will melt the worry and send it shooting far into the air as lava that runs slowly far away into the ocean. Repeat the process until all the worries have been transformed. Rocket Ship. Put your worries in a rocket ship and blast it off to outer space. Send the worries up, up, up to be transported to another galaxy far far away. Allow the rocket ship to have an infinite supply of fuel so that it can travel light years away. After each one of these, do an internal body scan in your imagination and see if there is any worry left. Ask you child to check in with that initial spot and see if it has changed in any way. 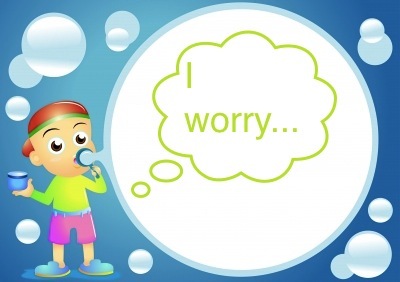 If there is still worry in the spot, then repeat the process until there is no worry left. Follow up the activity with a relaxation tool to relax the body and let go, returning to calm and feelings of wellbeing. It happens occasionally that a child doesn’t find any worry inside, but has been sharing one verbally with you prior to the body scan. If that is the case, simply bypass the body scan and ask your child if he would like to imagine placing the worry in a package. Then proceed with the visualization tools. Thanks for the wonderful ideas. I’m going to try the first one, the vacuum cleaner. We clean up our worries the same as we clean out those dust bunnies in the corners and under the beds. Just make them disappear with the vacuum cleaner. Lovely! I often use putting the worry into a hot air balloon and letting it float off into the sky.